Once again, a federal district court judge is telling government agencies to reconsider how they operate hydroelectric dams in the Columbia River Basin to better protect endangered salmon runs. The ruling Wednesday drew cheers from conservation, sport fishing and tribal representatives, who pushed for new solutions to buck the status quo -- up to and including removing all four dams on the Lower Snake River. Todd True, an attorney with the environmental group Earthjustice, spoke during a teleconference Thursday and said the system needs to operate more like a natural flowing river, and less like slack-water pools. "Those dams bubble to the top of things that need to be addressed," True said. On Wednesday, Judge Michael Simon rejected the feds' 2014 biological opinion for salmon in the Columbia Basin, saying it violates both the Endangered Species Act and National Environmental Policy Act. It's the fifth time a judge has ruled against the biological opinion, or BiOp, since the lawsuit was initially filed in 2001. True said the judge's ruling represents a real turning point in the issue, and the clearest indication yet that what the agencies have done to date isn't working. "I think the time for government stonewalling is over," True said. "I think starting over is exactly what the judge is asking us to do." Conservationists, along with the state of Oregon and Nez Perce Tribe, sued over the 2014 BiOp, which is prepared by the National Oceanic and Atmospheric Administration. The nuts and bolts of the plan are handled by the U.S. Army Corps of Engineers, which operates the dams, and Bonneville Power Administration, which markets the electricity to utilities such as the Umatilla Electric Cooperative. A spokesman for BPA said the agencies are disappointed and will take some time to fully digest the ruling. Terry Flores, with Northwest RiverPartners, said the ruling discounts billions of dollars worth of work on fish passage and habitat improvements that have helped some salmon runs eclipse records in recent years. Northwest RiverPartners represents the interests of utilities, farmers, ports and businesses on the Columbia and Snake rivers. Flores, the coalition's director, said continued litigation will only lead to more process, which does nothing positive for fish. She also said dam removal on the Lower Snake is a frustrating proposition that would eliminate up to 3,000 megawatts of clean, renewable power. "Obviously, fish would probably be better off without any dams," Flores said. "But you have to look at the whole picture." True said those options -- including increased spill over dams and potentially drawing down water behind the John Day Dam -- are all part of the equation. He was joined at Thursday's conference by Glen Spain, with the Pacific Coast Federation of Fishermen's Association; Liz Hamilton with the Northwest Sportfishing Industry Association; Anthony Johnson, chairman of the Nez Perce Tribal Executive Committee; Marc Krasnowsky, spokesman for the Northwest Energy Coalition; and Dustin Aherin, owner of Idaho River Adventures in Lewiston. Spain, whose organization represents commercial fishing families along the West Coast, said the 2014 BiOp represented "institutional insanity," and the judge's ruling gives them an opportunity to really think about a new way forward. He also said the Lower Snake River dams are, in many ways, no longer necessary. "It has cost us an enormous amount of money in the region to do the same failed things over and over," Spain said. 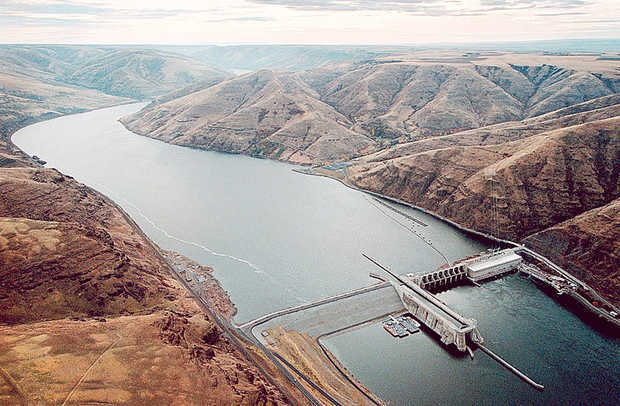 BPA and the Army Corps of Engineers argue they have made improvements at Columbia and Snake river dams to support fish passage. At McNary Dam, the Corps said it installed two weirs at spillway gates and re-routed its juvenile fish passage channel to boost survival rates. About 40 percent of the river is also spilled over the dam to ensure juveniles can pass, without over-saturating the water with gas bubbles that can actually harm fish. Salmon advocates say it hasn't been enough. Warm water in the basin was especially devastating to endangered sockeye last year, when 96 percent of the run died before ever making it to Lower Granite Dam in southeast Washington. The Nez Perce Tribe has stood alone among those challenging the BiOp. Johnson said the ruling was a powerful statement supporting their effort. "We know there is a long road ahead," he said. "We'll do everything necessary to ensure there are salmon for our children and grandchildren to come."